Acuvue Oasys for Astigmatism contact lenses are a great choice for many people with astigmatism. One nice thing about this lens is that it is manufactured in some of the higher powers of astigmatism correction. In the past, people with higher amounts of astigmatism would need to be fit in more customized options, which added to the cost and restricted the types of materials available. Since the manufacturer started producing Acuvue Oasys for Astigmatism contact lenses in the higher powers, we have been able to fit more patients successfully in this type of lens than ever before, saving them time and money, and allowing them to wear these new more breathable materials. You can purchase Acuvue Oasys for Astigmatism contact lenses from our office with just a phone call. If your last contact lens exam was with us, we’ll have your prescription on file for you, so there’ll be nothing you have to do other than give us a call and let us know how many boxes you’d like. 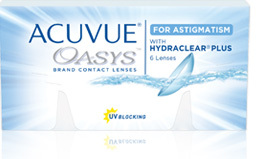 Acuvue Oasys for Astigmatism contact lenses are two week lenses and they come in a choice of a twelve pack or a twenty-four pack. So a six month supply for both eyes is two twelve packs, and a year’s supply is two twenty-four packs. If you pick your lenses up at our office then there’s no shipping charge, and it only takes a day, or sometimes two, for your lenses to arrive at our office. We can also ship your Acuvue Oasys for Astigmatism directly to your home. Shipping is free on annual supplies shipped to your home. If your last exam was with another office, we can request your prescription for Acuvue Oasys for Astigmatism from that office, though it is sometimes faster for you to send us your prescription by e-mail or fax, or bring it by our office. Contact lens prescriptions are valid for one year. If it has been more than a year since your last contact lens exam, you will need a new eye exam and CL fitting or evaluation to ensure that Acuvue Oasys for Astigmatism are still the best choice for your ocular health and vision. You can schedule your contact lens exam online or call our office at with any questions.